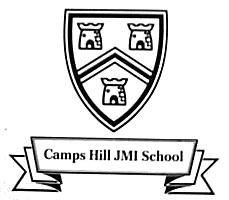 Camp’s Hill Junior Mixed School opened in 1959 and Camp’s Hill Infants School also opened in 1959, but in the late 1970’s the two schools merged and the School is now known as Camps Hill Community Primary School. The badge in the picture was the school badge in 1989. We do not know what the three towers represent or the chevron shape but we are keen to learn more about the history of the school. This page was added on 31/01/2011. Just found the book Brendon Chase as recommended on Winter Watch last night. For years I,ve been searching for the only poem I memorized which is in the opening page. I always remember Mr Chancellor reading it to us. From an ancient text. I too was at Camps Hill from the day the school opened- about six of us in Mr.Clark’s class at first. Those were the best two years of my life. I learnt HOW to learn. All my early education paled into insignificance compared to those two short years. Remember the pond being built. Playing the part of the sorcerer in the Sorcerer’s Apprentice, pottery after school and Mr.Chancellor reading Beowolf. Happy days! Susan (then Jones). I was lucky enough to go to Camps Hill when it first opened in 1959. The memory may have dulled a little but my recollection of the School badge was that the Towers denoted the fact that Camps Hill was originally a Roman settlement made up of 3 camps – each recognised by a Tower. I only spent one year there before ” going up” to Barnwell again in its opening year in 1960. I used to live in Burwell Road – Shephall – and remember well that Bandley Hill & Peartree school were full and we were picked up and delivered back by a coach from the jct of Burwell & Collenswood. The green coach belonged to a Mr & Mrs Crook(e) from Codicote who were ( to me) quite elderly at the time. My connections with Chells continued as I did a Paper Round from 13 to 16 for Mr Phillips at Burwell newsagents -my round was Chells Way Bernhardt Crescent & Eliot Road. In those days Chells way finished at Camps hill school adjacent to number 122 Chells way . The first Head of Camps Hill Junior School was Ron Shepherd, who left in July 1962. Acting Head until January 1963 was Terry Chancellor, then Leslie Binner took over from January 1963 – his retirement in July 1981. Other staff in the early years of Camps Hill Junior were Seftan(?) Clark (who later taught English at Collenswood Secondary School), Myrtle Pit-Keighley (nee Miss King), Mrs. Flynn and Ms. Lewis (who did Music).